The Disney Princesses are sure to bring some magic with this licensed 3D 15 X 18 Backyard combo! 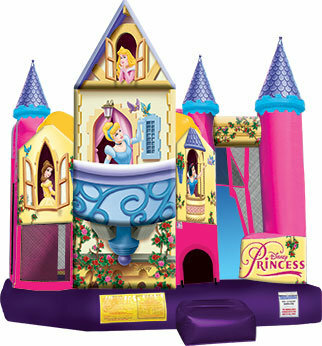 With its sweet 3D imagery, this licensed Backyard combo-style bounce house is a home for classic princesses Belle, Snow White, Cinderella and Sleeping Beauty. Girls will enjoy reigning over their castle, while boys can play the part of the gallant princes! This combo-style bounce house features a realistic 3D balcony for Cinderella, and is part of a spectacular line of licensed Disney Princess products! The licensed 3D Backyard combo-style bounce house is the ultimate in inflatable jumpers! The large 10 X 10 interior jumping area offers a basketball hoop. This bouncy castle has a climb feature and a convenient exit slide for hours of active fun! Parents and spectators are offered a clear view with the 360-degree mesh sides of this moonwalk. The 3D Backyard combo bounce house is made of lite n strong™ fire-resistant vinyl for safety, durability and easy portability. This 3D Backyard bouncy house is sure to make any indoor or outdoor event a great success!